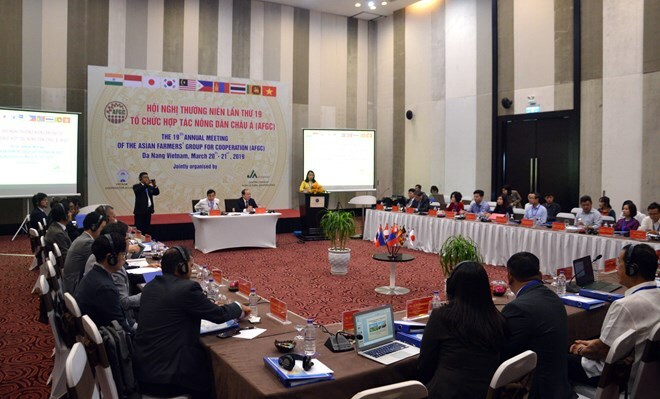 Da Nang (VNA) – Members of the Asian Farmers’ Group for Cooperation (AFGC) gathered at their 19th annual meeting in Da Nang city on March 20 to share experience in dealing with challenges from climate change facing farmers across Asia. It attracted representatives from India, Indonesia, Japan, the Republic of Korea, Malaysia, Mongolia, the Philippines, Sri Lanka, Thailand, and Vietnam. Pham Thi Hong Yen, head of the VCA’s International Cooperation Department, said that in 2018, Vietnam’s agro-forestry-fisheries sector posted a growth rate of 7.08 percent – the fastest pace since 2012. Exports of agro-forestry-aquatic products set a record of some 40.5 billion USD, helping the country affirm itself as a major agricultural exporter. However, Vietnam’s agriculture is suffering from serious impacts of climate change, she noted, citing statistics of the World Bank that Vietnam bears the most severe consequences on population and GDP growth among 84 developing coastal nations affected by the sea level rise. Rice productivity in the Mekong Delta – the largest agricultural hub of the country – could drop by 40.5 percent if the sea level rises by just 1 cm. Meanwhile, Vietnam ranks second in terms of impacts on the agricultural production land area, which may shrink by 12 percent in the Red River Delta and 24 percent in the Mekong Delta. Cooperatives are facing numerous difficulties in responding to climate change, Yen said, pointing to problems in state agencies’ management activities, cooperatives’ access to climate change information, application of technological advances, and financial and human resources capacity. Supporting cooperatives in the face of climate change, in 2018, the VCA carried out 77 models in which cooperatives associated their production with value chains. It helped them apply technologies to production activities and ensure the sale of their agricultural products. Each model was also assisted with 1,000 USD. Yen added the VCA plans to implement another 77 models nationwide this year, offering each of them 2,000 USD in financial support. Poramate Intarachumnum, head of the cooperative federation of Thailand, said there are 4,500 agricultural cooperatives in Thailand. To help them cope with climate change, the organisation has launched many initiatives, including a project on planting trees and saving water. In this project, cooperatives plant trees in their areas to protect the environment and water resources, thus maintaining the soil’s moisture. All 4,500 cooperatives have taken part in this drive.